Welcome to our dairy. We are a small family farm run mainly by Christine with the support of her husband, Jared and her three children, Daphne, Cyprus and Florence. Christine has had farming experience her whole life, but we started milking cows as Cast Iron Farm in 2010. 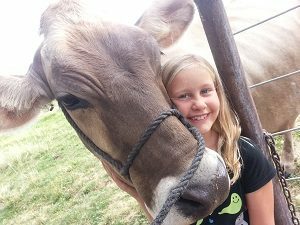 We all cows, but we especially love the Brown Swiss breed. 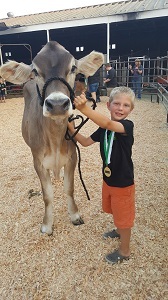 Brown Swiss are big, docile heritage breed cows that produces excellent protein and fat content in their milk. 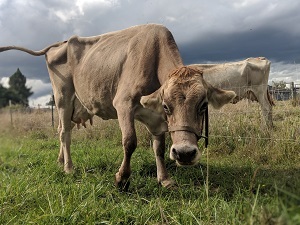 Aside from their personality, these lovely cows are ideal for our farm and for raw milk production, and we have had many Brown Swiss win our hearts over the years. We love operating as a small farm in our community with the opportunity to pamper our cows and calves. The time spent in the barn in the early hours of the day are the best part of the day and in the end, our cows provide us with so many delicious things. 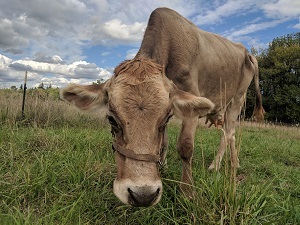 Lily is a beautiful Brown Swiss beauty. A dear friend had Lily before she came to our farm. Lily has a quiet, cautious personality. Her very favorite thing is to have the top of her head scratched when she is out in the field. Lily knows well the special call that will bring her to the gate, and she can reliably be found waiting for a bite to eat. Ash was born on our farm. She is the daughter of a past favorite cow named Willow. 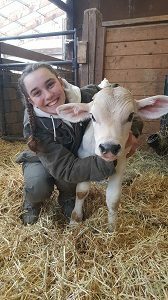 Ash is a registered Brown Swiss beauty and we look forward to many, many years milking her and seeing her cute calves. 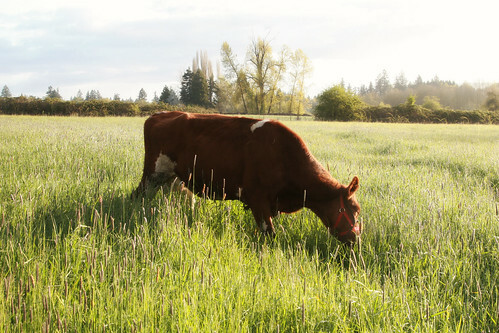 Fancee was the first cow we bought at Cast Iron Farm. We had many wonderful years with this cow and she gave us thousands of pounds of milk and many gorgeous cows. 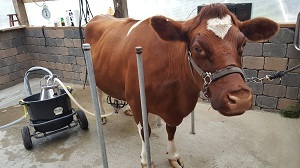 Fancee was queen of our farm from 2010 to 2018.Dairy cows rarely live to produce as a 12 year olds and we are grateful for her. The milking parlor is where the magic happens. The cows come into the parlor once per day. Our parlor was thoughtfully designed with many features that make it easy to milk cows the correct way. We have hot water set to 150 degrees to clean our equipment in the parlor. The waste water is taken out of the parlor by a floor drain that leads out into our drain field. All of the sanitary supplies are lined up and easy to identify. The milk machine is mounted to the wall of the parlor so that it is in easy view to monitor that it is milking at 11-12 pounds of pressure. The beautiful concrete pad has grooves in it so that the cows don’t slip on it. 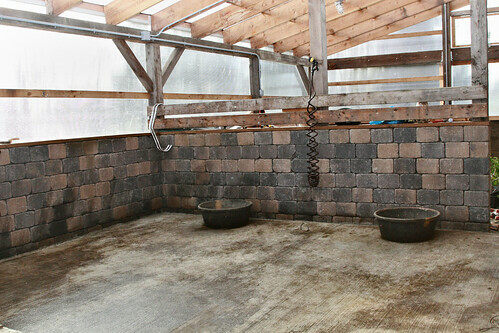 It is also graded so that the water drains fully out of the parlor, with no puddling. All of the sanitation equipment is in easy reach for the milker to grab at the right time. The pump is mounted on the wall on the right. This makes it very easily accessible. 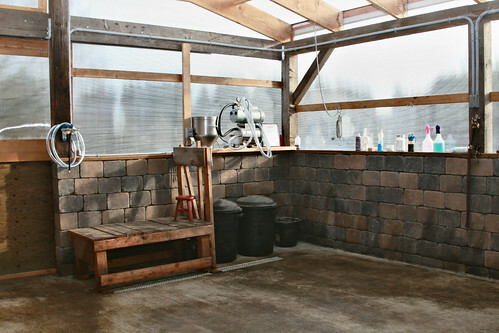 All in all, the parlor is a well organized space, that works very well for our goal of creating clean, nutritious milk.